As part of the BBC News website's One Day in Iraq coverage, on 7 June we monitored the Iraqi media and weblogs for news and comment, hearing about what Iraqis watched on TV, listened to on the radio and read in the newspapers. We also published e-mails received throughout the day from our readers in Iraq and elsewhere, responding to comments and answering your questions. This page was hosted by the BBC's Kevin Anderson and Martin Asser. The last message of the day comes from Nashwan al-Hashimi - a Shia resident of Baghdad - in an email sent to BBCArabic.com. It paints a dark picture of life in the Iraqi capital. "When I wake up everyday I ask God to protect Iraqis from all evils and I hope to hear during the day the least possible number of explosions. "I say this frankly, there is a great improvement in oil products and drinking water and there is a sharp and significant drop in terrorist operations specially after the launch of the great Operation Lightning. "Power outages are the biggest burden on Iraqis as power goes out for 8 to 16 hours daily and the truth is every time it goes out I curse Saddam and I curse the Americans and I wonder if it is true that the US is incapable of providing Iraqis with electricity even 2 years after the fall of the tyrant!! "We Iraqis in all honesty reproach our Arab brothers who instead of helping us rise from our troubles send to us herds of extremists to join the slaughter of Iraqis. "I tell them: 'God and his prophet are with us and Iraqis will rise like a giant and crush the rotten heads that you have sent to the country of prophets and imams and their remains shall rebound on you and destruction will be wrought upon you that will please Iraqis, God willing'." The famous Iraqi actor Tayib al-Furati dies. HNK is a young girl from Mosul who celebrated her 16th birthday a few days ago. Her English is a bit broken sometimes, but her frustration today is that she cannot read a French translation of her posts on another blog. "today for the third time this week I went out home 'not normal' some day before when I didn't went out of home for along long days I looked out side and see the sky, I don't know what happened to me. "It looks like this is the first time I see it, I just want to cry I felt strange feeling. I have a problem here; every movement in the house, every thing happened I wrote it in my mind as a post in the blog. And that is bothering me a little. "I tried to read it And I CANT UNDERSTOOD WHAT I SAID I am really bad in French that I couldn't understood what I (I) wrote. Now I understand why I got less mark in French NOW I GOT IT. Any way thanks "merci" for the people who translated my post into French. "I am feeling greatful for you that you read my blog and as I read in one blog that I am writing in a strange way for you. well that's nice. Before its 1800 (1400 GMT) news bulletin, state-owned al-Iraqiya TV broadcasts an appeal urging Iraqis to inform on insurgents. The appeal shows a woman spotting men carrying weapons under a blanket. She is then shown rushing inside with her child and making a telephone call. "So that terrorism has no place in our tomorrow, call the Interior Ministry on 130. Help us fight terrorism - call the following numbers. For Iraq's sake, keep your eyes open," the voice over says. The subsequent bulletin is led by Iraqi government spokesman Leith Kubba saying that the latest crackdown on the insurgency, Operation Lightning, has been a success so far. "There have been tangible improvements in the security situation in Baghdad and other cities. All predictions indicate that these networks' operations have shrunk," he says. Here's Kifaya Kareem from Baghdad, who has e-mailed BBCArabic.com with a heartfelt grievance - what he calls the "multi-faceted" environmental problems his city faces. "We experience noise pollution hour by hour as planes roam our skies all the time at very low altitudes and ambulances and police cars and the national guard and the occupying forces never drive through the streets without their sirens wailing. "Joining the party are members of the government and parliament who move in gigantic convoys led by the special guard with the incessant buzz of alarms. Residents chip in with their car horns during heavy traffic, and nervous citizens quarrel as vendors yell to announce their goods. There's more but I can't fit it all in. "As for visual pollution it goes with the images associated with the sounds described above, plus the tons of rubbish and concrete barriers and roads closed for some reason - or even without reason. Plus the endless rows of the jobless waiting at the doors of government agencies. "As for biological pollution we've got polluted water, rotten food, dusty air full of the residues of war, exhaust smoke and old factories. "Dozens of newspapers and satellite channels full of lies and official statements worth less than the ink they were written with constitute the media pollution. "All considered, we are left with perpetual suffocation and headaches and eye strain, and distress." Faiza is the mother in a family of bloggers, and she writes the Family in Baghdad blog. On her blog, she tells about her daily life and her thoughts, but she also gives Arabic lessons and has an online Iraqi cookbook. Today, she is considering the current state of affairs in Iraq and the path forward to the future. "If you have met an Iraqi man or women, coming from Iraqi new government, you will hear another stories, they will say: 'Oh, yes, we have occupation force in our country, but we are happy, and everything is going well!'" Faiza writes. "If I have met any one from any country on this earth, I could say: 'How come? Can you believe that a nation can be happy with its occupier?'" she asks. She looks to the future of Iraq but asks how her country will get there. "I believe in the power of people, and the future will be done by people's hands faraway from corrupted or puppets (governments or parties)," she says. She adds: "And this equation will be right for all oppressed nations. We should find new peaceful, honest, leaders like Ghandi or Martin Luther King." From Baghdad resident Ayman al-Saadi, an email which seems to answer the Have Your Say question posed above. It was sent to BBCArabic.com. "We now have hope in life while we used to be merely numbers, and citizens in name only. We now have a voice to criticise and to support and oppose and rally. We now have meetings and groups and institutions and parties to express our troubles and aspirations. In a word, we now have a nation. "Dear mother, dear father, you are responsible for your children's lives. Have them vaccinated against polio in the national campaign, by medical teams which will be carrying out housecalls, or at health centres for the under-fives. There will be two stages to the campaign. The first runs from 19 June 2005, for five days. The second runs from 24 July 2005, for five days." Afterwards, al-Iraqiya shows a Japanese cartoon from about 30 minutes about a young tiger cub making its way in a world of wolves and other animals big and small, with the presence of a Japanese woman and child travelling in a jeep (the connection between them is not immediately clear). Al-Sharqiya's updated news bulletin is followed by a review of the day's press, then a Tom and Jerry cartoon. Andrew Wheeler of Madrid e-mails Have Your Say to ask why there is a concentration on violence in Baghdad and its environs, when events in other Iraqi cities might present a different picture. "Why doesn't the world press and media show us the other side of the story? Surely there are other cities where Iraqi citizens enjoy relative peace and get on with their lives in freedom?" he asks. The answer is that international newsgathing is centred on Baghdad because non-Iraqi journalists seldom venture further afield due to concerns about their safety. There have been frequent waves of violence elsewhere, even in the supposedly peaceful southern provinces. Some more of your e-mails to BBCArabic.com now, including a tale of tragedy in Baghdad, and a hymn of hope from Najaf. "I lost my husband in the current violence and with him I lost all my dreams and hopes, and the dreams of my children. I headed to work hoping I can set the wheel of life in motion again in my home. All I can say is that I am now afraid of everything. I am afraid while I head to work and while I head home and I fear for my children and I fear the unknown. Simply put, I live a state of insecurity in all its forms. This sums up our life in Iraq. Um Sara - Baghdad." "Today's Iraq rests on a beautiful dream and is not frightened by the multitude of visions and the conflict of ideas. But what hurts Iraq and its people is for its flowers to be plucked daily by the hatred of car bombs and explosives. People here are no different from the rest of humanity, for they seek security and stability and economic luxury far from the dagger of terrorism and the tyranny of the occupier, and they have placed these hopes in the ballot boxes and will do so again in the coming elections with unprecedented confidence and with insistence to which all lovers of freedom will kneel and the end will be beautiful, God willing. Hashem al-Baaj - Najaf." "In spite of all the bad things we face on a daily basis in Iraq, life is beautiful without Saddam and the Baathists such as al-Douri and al-Jazrawi and al-Zubaidi. Today there's a lot of talk about sectarianism but no one looks back to remember who were the people Saddam governed Iraq with and who it was he used for murder and destruction. We should fight Baathism and sectarianism to live in peace like other people. Jalal Baghdadi - Baghdad." Iraq's youth football team has beaten its Syrian counterpart 2-1 according to al-Sharqiya reporting from Baghdad. "Iraq's Alaa Abdul Zahra scored the first goal from a penalty kick in the 38th minute. At the beginning of the second half Khaled Saleh scored the equaliser for the Syrian team, but Iraqi substitute player Mohammad Kalaf quickly scored again. The two teams will play again next Thursday. The report does not clarify where the games are taking place. Al-Sharqiya's 1400 (1000 GMT) news bulletin has a female newsreader reading out the top stories. The first story says 28 people have been wounded in northern Baghdad by a suicide attack. The second story concerns the three, or possibly four, suicide attacks near Kirkuk. The death toll has risen to 18, the report says. It's a relatively quiet day on blogs in Iraq, although the topic of Iraq is always something that swirls through the blogs. For weeks, talk of the so-called Downing Street memo has dominated US and UK political blogs, and it continues today although the memo originally came to light in the beginning of May. The memo is minutes from a July 2002 meeting with Prime Minister Blair, members of his cabinet and key intelligence figures. Left wing bloggers have seized on lines that based on talks in Washington "military action was now seen as inevitable". "Bush wanted to remove Saddam, through military action, justified by the conjunction of terrorism and WMD. But the intelligence and facts were being fixed around the policy," according to the memo. Bloggers on the left have tried not only to keep the memo in the media limelight. They have set up a website and gathered signatures for a petition calling on President Bush to answer questions about the memo. But conservative bloggers have not remained quiet. Blogs for Bush writes: "The left is trying to make a mountain out of this very small mole hill." "The left hates President Bush so much that anything which can even be misinterpreted to harm the President becomes central to leftwing thinking," the bloggers for Bush continue. At 1330 (0930 GMT) Al-Iraqiya TV broadcasts an interview with a 50-year-old beggar woman on a Baghdad street. The beggar tells the reporter: "My husband is dead. I've been looking for work, but couldn't find any. I've got no income or other means of support, such as a pension. I've got two children, aged 15 and 13, who are just sitting around at home." The TV team give the black-clad figure some money before moving on. Jobs and security are inextricably linked in the minds of many Iraqis, whatever their station in life. Iraq is an oil-rich country and should have been booming by now, but for the security situation. Instead it's absolutely back to bare bones. People are trying to make a living but they're struggling. They are out and about in the streets, the streets are not deserted, people aren't just sitting at home. But they risk all the problems and all the threats on their way to work and back - car bombs at checkpoints which cause huge traffic jams and so on. Economic investment and job creation is absolutely minimal. Ironically, security is providing the only real source of employment. There are people queuing up in the early mornings to join the police or the army, even though they're a major target for the insurgents and of course they do pay a price because often they are attacked by suicide bombers. Without economic security I don't think there can be stability in Iraq, and until there is a stable security situation, the economy is not going to start booming. But things may slowly, slowly get better. Once some basic security has been established I think Iraq can really prosper but that may be a long way down the road. Wissam al-Saadi, from the northern city of Mosul, has e-mailed BBCArabic.com with his view of what it's like to be an Iraqi citizen living in these troubled times. He ends with a sardonic comment on what his compatriots would really make of it if they did have an easy life. Iraqis "experience different conflicts ranging from simple dream of a civilised, strong and developed Iraq to the concern of losing a family member, from the fear of the unknown to his desire to preserve what is left of his dignity after the US forces and the Iraqi security forces trampled on all the meanings of dignity. "The Iraqi citizen respects life and works hard for his future and teaches his children and sends them to school and deals with issues great and small and criticises and accepts criticism and says what he wants. In spite of all the challenges I use the internet and write articles and participate in building the institutions of civil society. "We are Iraqis after all and we don't like life except with difficulties and crises." "Some people are so narrow-minded as to think there is no point trying to institute integrity where corruption reigns supreme. Once, I ventured to ask one of those cynics what he thought of the current political process and the new situation it has resulted in. His reply was that the country has gone to the dogs, everything has been pillaged and there is ruin everywhere. When I asked him what he intended to do about it, he said coldly that he was just looking on." Al-Sharqiya's website, citing a study in Baghdad university, says that the majority of mobile phone users in Iraq spend between 25% and 50% of their monthly income paying for their phone bills. The study appeals to mobile phone companies to take practical steps to provide better services to the users and preserve them to earn the consumers' trust. It also points to a rise in the prices of top-up cards in the local market and a rise in the price of a one-minute call in comparison to neighbouring countries. 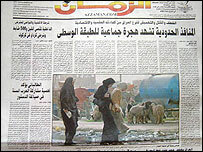 Today's Baghdad newspapers all bemoan the miserable state of the country's infrastructure - the independent Azzaman splashes (literally) with a front-page photo of three young women picking their way through sewage in the streets of the poor Shia neighbourhood in Baghdad known as Sadr City, with the paper warning of an environmental disaster. 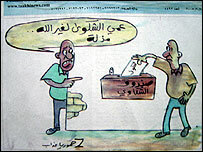 The well-regarded Kurdish newspaper Attaakhi, published in Baghdad by the Kurdistan Democratic Party, has a cartoon showing a man dropping a complaint into a complaints box at a government ministry. A civil servant tells him: "Don't waste your time. In the current circumstances you can only complain to God." Azzaman's editorial looks at Iraq's post-war brain drain, accompanied by interviews with educated Iraqis who are planning to start a new life abroad because of the insecurity and threat of kidnapping. Al-Sabbah, a US-backed quality newspaper, urges the media to play its role in building democracy in Iraq. The government and the ruling elite must provide freedom of information, while the people must develop their own ability to express their ambitions in a civilised way, it says. Al-Mashriq reports that Baghdad City Council claims to be losing 12bn Iraqi dinars ($8m) through unpaid business rates. One of the complaints is that high-street shops and businesses are taking down their signs to avoid paying "Sign Tax". The tax is charged according to size and quality of signs on display. So no sign, no tax! Here are some other headlines in today's press. At 1100 (0700 GMT) Sharqiya TV starts broadcasting a locally-produced drama called Nightwolves. Armed thugs drive around in the streets committing crimes, including the abduction of two elderly men who are driven off into the desert. It's a reflection of the lawlessness that's become a part of ordinary Iraqis' everyday lives. The episode ends on a cliff-hanger. The kidnappers come to a river and tell the old men to swim across it. But the victims say they can't swim... Will they make it to the other side? Al Sharqiya - originally known derisively as al-Baathiya, because of its perceived links to the old regime - has been gaining a growing audience with its mixture of popular current affairs, satire and comedy shows poking fun at the new Iraq. It's biggest hit so far has been a daily soap opera called Love and War, mixing comedy, romance and the sudden brutality of conflict. 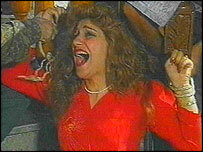 The series finale ended with the two main characters finally married after overcoming a host of obstacles - only to be blown up and killed by a suicide bomber as they headed towards their honeymoon. Bloggers on the right and left in the US have seized on a final despatch from Newsweek's outgoing Baghdad bureau chief for the last two years, Rod Nordland. Under the headline, "Good Intentions, Gone Bad", he writes: "Two years ago I went to Iraq as an unabashed believer in toppling Saddam Hussein." However, "since April 2004 the liberation of Iraq has become a desperate exercise in damage control," he adds. The conservative blogger "The Anti-Idiotarian Rottweiler" doesn't think too much of Mr Nordland who he ridicules as a "quagmire-croaking moonbat". The right-wing Rottweiler does a greatest hits review of Mr Nordland's Iraq coverage and comes to the conclusion, "it's just another media muppet mouthing that our efforts are doomed." But left-leaning blogger Brad DeLong wrote: "Shouldn't Newsweek's Baghdad bureau chief have been writing stories like this last year? Why wait until now?" One of the most influential blogs on the left in the US, Daily Kos, writes: "The truth hurts." He quotes extensively from the Newsweek piece before closing his post with an understated: "Ouch." "I want to say that the situation in Iraq is not good, but we can see that the heroes of Iraq sacrifice themselves to keep the smiles on the faces of the children. Pray to God to preserve the heroes of the police and the army and the guards and every honourable Iraqi - Baghdad resident." "Iraq is the country of the forgotten, of those forsaken by humanity who are withering beneath the heat of the sun and of bombs, one after the other. No one knows anything about them except through the daily news in just a few minutes, and then they disappear. Their dreams are stolen and their innocence killed and their bodies spread in the streets. This is our destiny... This is our beautiful Iraq, despite its cruel bitterness - Ali al-Rassam, Iraq." A look at the morning TV programmes reveals a preference for non-Iraqi news stories - although the official al-Iraqiya station reports arrests of insurgent suspects during a major security sweep in and around Baghdad called Operation Lightning:. "South of Baghdad as part of Operation Lightning a dangerous terrorist was captured who was responsible for financing attacks on civilians. So far 887 terrorists have been arrested. 38 weapons caches have been found." The Iran-based Arabic channel al-Alam reports that the radical Shia cleric Moqtada Sadr has condemned Iraqi government's decision calling the coalition forces to extend stay in Iraq. "Iraqi society is like a bunch of flowers. It has every colour, every scent. This bunch of flowers provides a very beautiful sight, befitting Iraq. Iraq is rich and this richness goes back to 7,000 years of civilisation, in which all component groups lived in brotherhood." "Medical sources in Amman say Raghad, 'the Daughter of the Rat', was saved from her latest suicide attempt about 10 days ago. She has been certified insane and put under close observation. "As for the Rat [Saddam] the judge confirmed that he has suffered a breakdown... but the so-called defence team has convinced him that the best way to escape the gallows is by feigning insanity." Stephen is a first lieutenant in the US Army and one of the many milbloggers, soldiers, sailors, marines and airmen writing a blog. Life in Iraq for the milbloggers can be filled with violence and chaos, but it can also be boring and tedious. "Last night was pretty quiet. Nothing really happened, which I hear from my family and friends is a good thing. Last night was one of the few nights when nothing actually did happen," Stephen wrote. "We did not confiscate any weapons or have any issues with any of the Local Nationals." In lieu of any military action, he went off to find the scorpion he had seen the night before. They found the scorpion and got a metal rod to try to coax the scorpion into a metal jar. "As it began to move CPL Kennedy screamed like a little girl and ran, all the while still trying to take pictures. "SGT Barnhart and I laughed so hard that one of the guard towers heard us and was trying to figure out what was going on. "It was so funny and a good break in the slow pace of Gunner Gate. Anyway it was pretty fun for one night in Iraq."